John (Aisling O’Mara) has returned home from Belfast as her mother is dying. She is in the hospital and there seems little hope that she will survive. The other members of the family are ready for her passing, but John is not as well prepared. She hasn’t seen her mother in many years and is unwilling to accept what Cinnamon (Danielle Galligan) says is true; that her mother is ready to die. The four sisters meet in the apartment they grew up in and go through some of the usual games they played as children, in this bizarre tale of a twisted family structure. 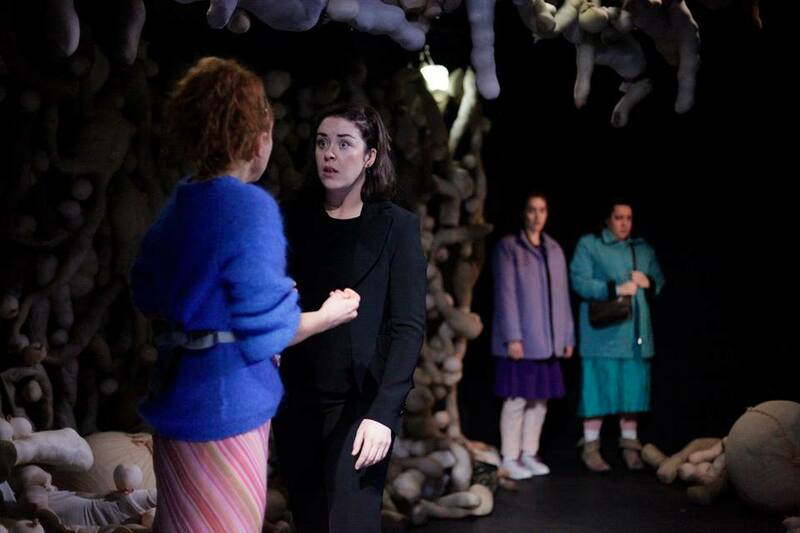 This is a new work by Ciara Elizabeth Smyth, who previously brought us All Honey, which won the Fishamble New Writing Award at 2017’s Dublin Fringe Festival. This new work seems quite difficult to pin down, due to its surreal style and format. We’re not quite sure how much of what we see is really taking place, or what is part of some dream or flight of fancy. The set design by Naomi Faughnan is definitely worthy of a mention, as right from the off it sets the viewer’s mind racing. It stage is filled with a wall of twisted growths, like strange tumours that are out of control. The setting gives the designer much freedom and it helps us understand this unusual world. The play is absurdist in nature and draws from writers like Philip Ridley that aim to confuse and confound the audience. At times it is hilarious and other sequences leave you little more than bemused. The dynamics between the four sisters are well drawn out and seem to have developed over many years. This short play gives us an insight into their many complexities but never reveals all. Some scenes are played out repeatedly, from different perspectives, allowing you to see inside the character’s heads. It is certainly one of the more unusual new works you’ll see on stage in Dublin this year.